Nanofibrillated cellulose (NFC) has been widely used in bio-composites and plays a critical role of interface phase in determining the final physical properties. However, it remains difficult to directly observe NFC and its network-like phase within its related composite. Herein, we report a facile and low-cost approach to visualize three-dimensional (3D) distribution of NFC and its interfacial morphology with confocal laser scanning microscopy. 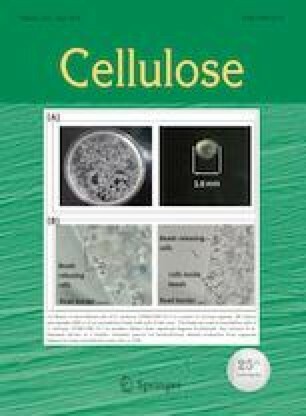 In this work, coumarin-3-carboxylic acid (C3) was chemically linked with TEMPO-oxidized nanofibrillated cellulose (TNFC) via amidation process with the aid of ethylenediamine, leading to the formation of fluorescent labelled nanocellulose (TNFC-C3). TNFC-C3 was then compounded with poly(vinyl alcohol) (PVA) as a reinforcing nanofiller because of abundant molecular hydrogen-bonding interactions. The spatial distribution and interfacial bonding characteristics of TNFC in composites were investigated. Fluorescence scanning shows a clear 3D network structure of TNFC-C3 in TNFC-C3/PVA composite. 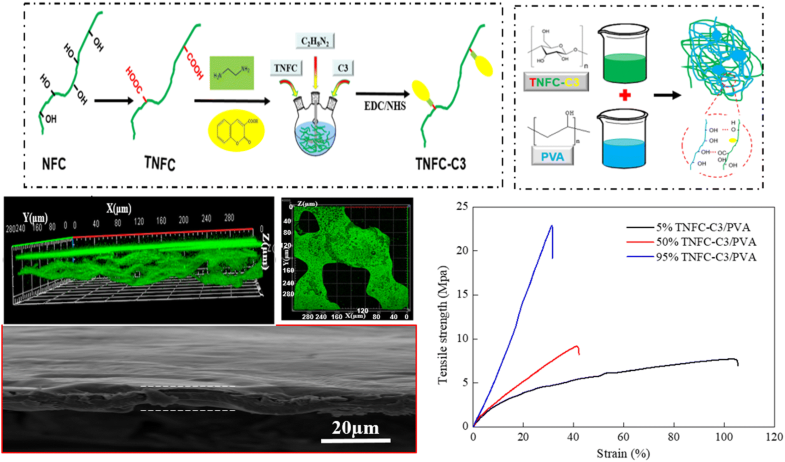 More importantly, TNFC-C3/PVA composites show increased mechanical strength from 7.5 to 23.2 MPa with the increase of TNFC-C3 content, indicating that a small number of C3-grafting result in high-quality of fluorescence resolution without sacrificing molecular interactions and reinforcing effect. We greatly acknowledge the financial support from the Natural National Science Foundation of China (Grant No. 21704058), Key Laboratory Research Project of Shaanxi Education Department (Project No. 18JS011), State Key Laboratory of Electrical Insulation and Power Equipment (EIPE19201), and the Fundamental Research Funds for the Central Universities (Project No. 31020180QD117).